This place. Oh, how I wish I could do this experience justice, but these words and photos won’t be enough. The food. The setting. The staff. All a perfect embodiment of their home island, and when they come together, it’s something you can’t miss if you’re visiting the Garden Isle. We ventured here for dinner on our fourth night on Kaua’i, and I wish we’d gone sooner. This little gem is tucked away right off of Kuhio Highway, right before you reach Kapa’a from Lihue, and it’s far enough off the beaten path that you just might miss it if you don’t look closely, but that would be your mistake. This place is adorable, and their “dining room” is a quaint patio with glass pebbles, string lights, fresh flowers and plenty of palms. What more could you want? Everything we tried was incredible, and I mean every. Single. Thing. We tried the featured appetizer of stuffed mushrooms and the tomato bruschetta as starters, and Jon nearly didn’t let me get to a mushroom, he liked them so much! The bruschetta was perfectly crisp bread with garlicky oil, perfectly ripe tomatoes and a delicious balsamic reduction – perfect after a long day in the sun! We split the coconut mac nut tofu for dinner, and had a surprise dish as well from the owner, a purple potato samosa with banana chutney. GUYS. The coconut sauce on this tofu, it was unreal. There’s nothing like the taste of a ripe, fresh and local coconut. Mixed with the mac nut crusted tofu, veggies and rice, it was the epitome of a tropical meal that filled us up after a long day at sea… and the samosa! The color was such a beautiful discovery, and the flavor of the banana chutney was the most decadent mix of sweet and savory. We’re coming back at many times as our schedule will allow until we leave, and honestly, if you’re headed to this island, you need to make it to this spot, whether you’re vegan or not. The food is so fresh, the staff so friendly, and the ambiance so wonderfully Hawaiian, it really is a must-see. Mahalo, Eat Healthy Kaua’i! It’s officially soup season, and I’m ready to BROC. Ok, yes that’s cheezy, but not as much as this simple, delicious and cozy soup recipe. Give me 20 minutes, and I’ll give you a dinner that will last all week. In a large pot, bring the vegetable stock and the cauliflower to a simmer, and let cook for 5-8 minutes or until cauliflower is tender. While cauliflower is cooking, slice carrots into thin discs and combine with broccoli pieces. Blend cauliflower and stock in blender until puréed and return to pot. Drain and rinse the beans, then blend with the almond milk and add to pot. Add the spices, nutritional yeast, broccoli and carrots to the pot and let simmer on low for 7-8 minutes. Add most of the vegan cheeze to the soup, stirring frequently to incorporate. Serve, topping with the remaining cheeze! This recipe is great to prep and have for lunches during the week, and is packed with plant proteins and fats. Enjoy!! Hello friends. After much ado (about nothing), my effort to post to my blog, rather than just my Insta, has returned, and at the perfect time. I’m not usually one to write reviews of specific products, because I myself am sometimes hesitant to read them without knowing the context in which they were written… so here’s the backstory. I met the wonderful Christy White, who owns the Cincy-based Whirlybird Granola, at kickoff for the Columbus Marathon last week. She handed me a sample of her ‘nola, and guys, I was HOOKED. These granolas are everything I’ve been searching for in a good vegan snack/topping. They’re made with non-GMO ingredients, they don’t have any hyper-processed ingredients, they’re made in small batches with just a tiny bit of all-natural sweetness and they. are. delicious. There are three flavors. The Vanilla Berry is teeming with dried blueberries and a strong spice of cardamom, which makes it this warm and cozy, blueberry-chai-like crumble that’s perfect to throw on a warm oatmeal. The original is filled with cranberries, pepitas and cinnamon, making it my new favorite fall treat for butternut squash, sweet potatoes, and baking (recipe for some pumpkin muffins coming SOON). That said, Chocolate may be my favorite. It has teeny tiny chips in it that make you feel as though you’re eating oatmeal chocolate cookies for breakfast, but without all the added sweetness. I have been eating it straight out of the bag for the last week, so much so that I now have to ration myself. After a week, these are already a staple in my house, and I can’t wait to share some recipes with you! Also, I’m always looking for more minimally-processed foods to add in/swap into my diet. So what else do you know of that’s the Whirlybird for other foods? Summer on the horizon has me all sorts of excited. I LIVE for farmers market season, and this year, I got a bit over eager and started toying with one of my fave recipes a bit early. The results were delicious. 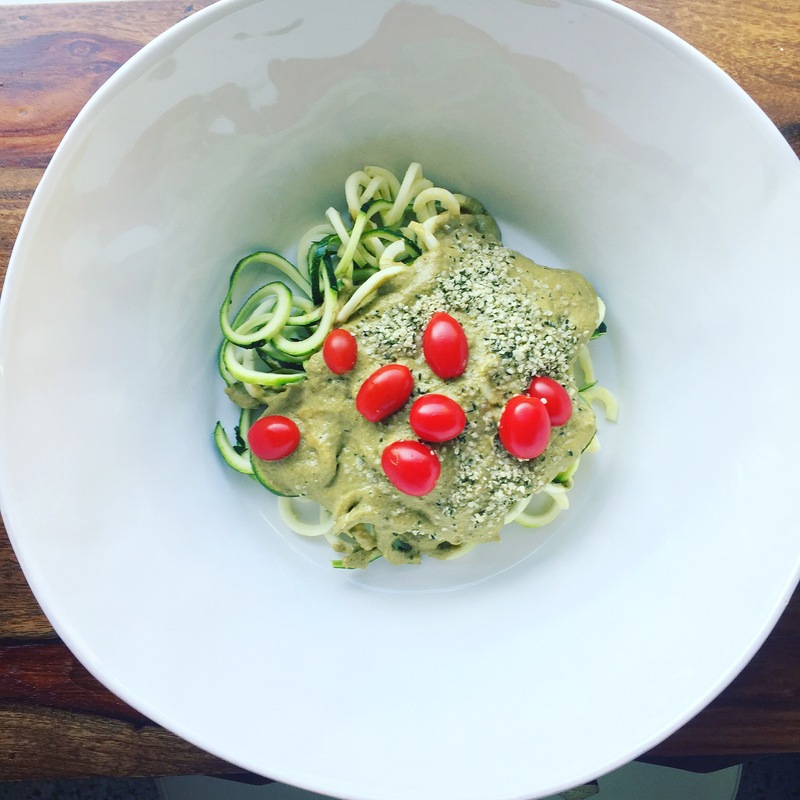 This raw zoodle dish is a perfect meal on a warm day, and keeps perfectly for leftovers for the next day’s lunch! Spiralize the zucchini (I use the KitchenAid spiralizing attachment – it’s so worth the $!) and set aside in a large bowl. Combine all the rest of the ingredients except for the cherry tomatoes in the blender and pulse until well combined. Pour over the zucchini and stir lightly. Slice the tomatoes and add with a bit more hemp as a garnish if you prefer! Store in the fridge for 1-3 days and enjoy! This is such a yummy and light summer dish that is so delicious without even being heated! 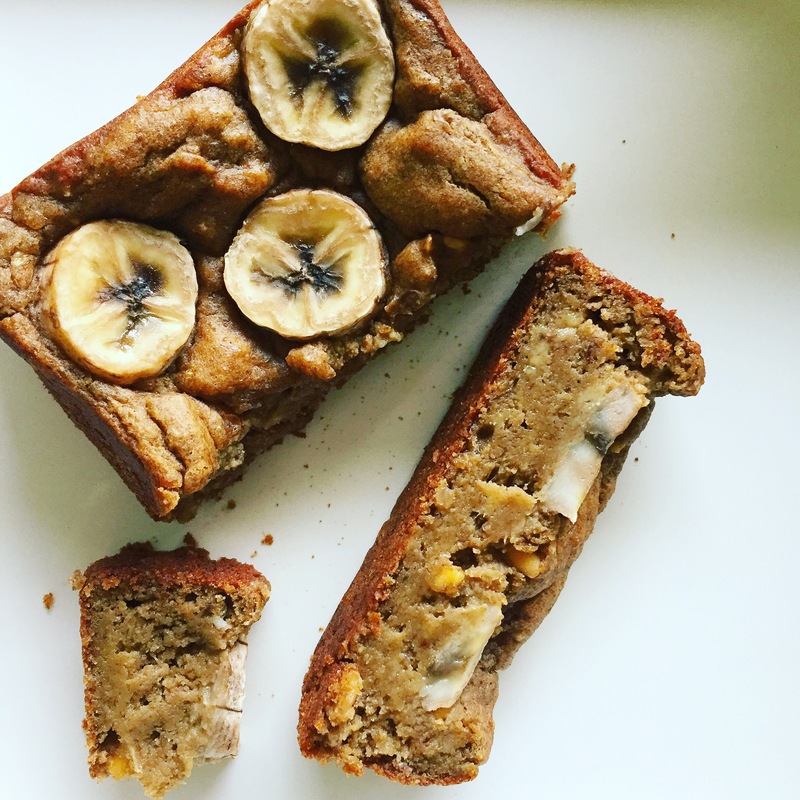 Go bananas, go, go bananas for this single-serve, protein-filled goodness that is perfect for a post-workout snack or breakfast on the go! I love banana bread, of all types. Add nuts, add peanut butter, add chocolate chips, chia, flax, whatever and I’m in. This one however is such a simple, yummy go-to, that it’s now become a staple! Preheat oven to 375 degrees. Spray pan with coconut oil spray. Mix mashed banana, flax egg, almond milk and PB in a medium-sized bowl. Add in flour, spices, protein powder and baking soda and mix until well combined. Add a bit more almond milk if your mixture is not the consistency of cake batter. Pour into pan, top with banana slices and bake for 20-25 minutes until toothpick comes out clean. Enjoy!!! Summertime is coming! I’m starting to get the itch to make yummy and cool desserts again, so here’s a new, citrus-y variety of an old favorite, this time with real pie crust! Preheat oven as specified for your pie crust (mine said 400 degrees). Let pie crust thaw for about ten minutes, and poke it lightly on bottom and sides with fork, so it doesn’t inflate while warming. Place in oven until lightly browned. Remove to cool. As crust is cooling, slice blood orange in half, and then keep once slice to top the cake. Juice the rest of the orange. To get the yield of the vanilla bean, use a sharp knife to slice the length of the bean, then run a spoon along the inside, down the cut you made. Place this yield in a high powered blender with the remaining ingredients: blood orange juice, cashew milk, cashews, honey and cardamom. Blend until thoroughly combined in a smooth mixture. Pour into the crust, and place orange slice on top. Freeze for 5-6 hours, and remove from freezer 20-30 minutes before serving. Can be stored in refrigerator for up to 5 days or freezer for up to 2 weeks. Enjoy! !